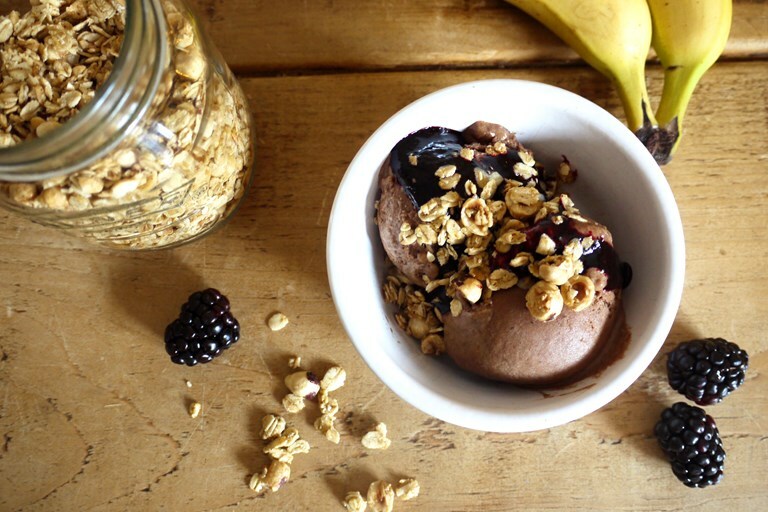 This vegan banana ice cream recipe offers a fantastic way to use up leftover frozen bananas for a creamy yet healthy chocolate 'nice cream'. Kate also uses frozen blackberries to make a luscious fruit compote, and finishes this healthy dessert with a hazelnut crunch. Since having a baby, I’ve gone from having a packet of petit pois and a few ice cubes to storing full on meals, baked goods and all sorts of other odds and ends in our freezer. Not only is it brilliant when batch cooking for babies (and adults for that matter, although our portions tend to take up more room), the freezer is also a great place to store any leftovers you might otherwise have thrown away, from ends of bread to overripe fruit. With bread, I always keep the outside crust to stop the inside going hard when exposed to the air. By the time we get to the end of a loaf, that crust is usually pretty penitential, so I’ll pop it in a zip lock bag in the freezer for future use blitzed as breadcrumbs in meatballs, burgers or on top of pasta dishes. I’ll also freeze the chicken carcass after a Sunday roast and, once I have two or three saved up, I’ll make up a giant batch of stock which can then be used in soups, stews and risottos throughout the week (and also frozen for future use). When freezing ingredients, make sure to think about how you’re going to use them once defrosted. For example, if you have six egg whites left over from making a batch of ice cream, you might prefer to freeze them in a couple of batches to avoid wastage. Double bag any food that might impart flavour into other things stored in the freezer (or pick up unwanted flavours themselves) and make sure to label and date individual ingredients to avoid any confusion over what it is you’ve frozen or whether it’s still safe to eat. Smoothies are one of my favourite breakfasts on-the-go, so I always keep a tub of frozen fruit on hand for making them – frozen banana in particular gives blended drinks a beautifully creamy texture and can even be used to make a healthy alternative to ice cream, as in the recipe below. This simple three ingredient treat is the perfect way to use up overripe bananas and is rich, smooth and delicious, making for a totally credible alternative to ice creams made with dairy and refined sugar. The blackberry coulis and hazelnut crunch add a lovely sharpness and crunch and the whole recipe happens to be vegan and pretty healthy to boot. Ice cream for breakfast anyone?